Red pandas usually live in the temperate forests of the Himalayan foothills and other Asian mountains, where climates remain consistently cool and rainy throughout the year. They forage for bamboo at night and curl up in trees to sleep during the daylight hours. Unfortunately, these adorable animals are endangered in the wild, and they're often illegal as pets. You can observe and appreciate them at many U.S. zoos. 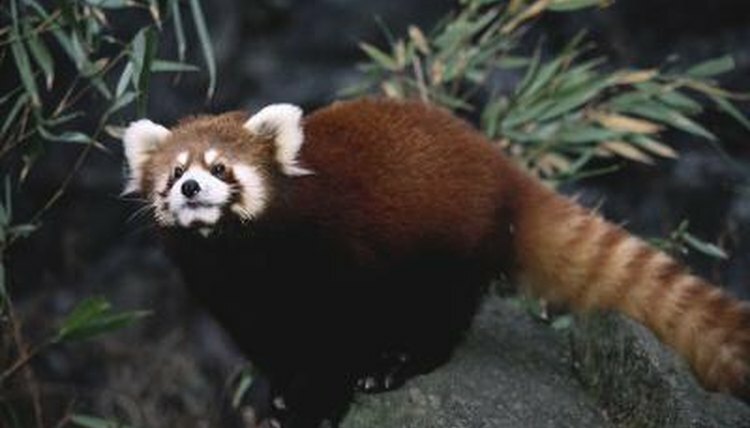 Red pandas' range spreads from northeastern India through Nepal and Bhutan to Myanmar and southwestern China. Most of these areas receive around 140 inches of rain annually and sometimes see some snowfall. Although their native forests receive a lot of rain, captive red pandas have a low tolerance for hot, humid weather. When temperatures climb above 75 to 80 degrees Fahrenheit, red pandas are susceptible to heat stress, especially if there’s high humidity in the air, too. Over most of the red pandas’ range, temperatures remain between 50 and 75 degrees Fahrenheit throughout the year. Usually the animals are relatively comfortable in temperatures down to the mid-30s Fahrenheit, because they’re better equipped for cold weather than for heat. The fur that covers their bodies, including on the bottoms of their feet, helps trap warmth. They wrap their tails around themselves when they sleep. Red pandas generally live in altitudes between 4,800 and 13,000 feet. A few live at lower elevations. For example, in the northeastern Indian state of Meghalaya, red pandas exist in tropical and subtropical forests as low as 3,000 feet. Most of the time, red pandas live in forests that have conifer and deciduous trees covering an understory of bamboo. Red pandas sleep in trees during the day and forage for bamboo -- which makes up 95 percent of their diet -- at night. They seem to prefer areas with tree stumps, logs and other detritus that they can climb to reach bamboo leaves. Many of the trees they climb to sleep and hide in are covered in red moss and white lichens, aiding the pandas’ coloring to help camouflage them. The amount of bamboo available to red pandas is decreasing as forests are logged, clear-cut for farmland and replaced with human population. Some people hunt red pandas for their meat or pelts. The illegal pet trade has also cut into their numbers. The International Union for Conservation of Nature listed red pandas as vulnerable in 2008, citing a wild population of fewer than 10,000 animals. In 2012, the Convention on International Trade in Endangered Species of Wild Flora and Fauna categorized red pandas as threatened with extinction. As a result, it's illegal to keep red pandas as pets in many countries, and most U.S. states prohibit them.